Lung abscess is defined as necrosis of the pulmonary tissue and formation of cavities containing necrotic debris or fluid caused by microbial infection. The formation of multiple small (<2 cm) abscesses is occasionally referred to as necrotizing pneumonia or lung gangrene. Both lung abscess and necrotizing pneumonia are manifestations of a similar pathologic process. Failure to recognize and treat lung abscess is associated with poor clinical outcome. In the 1920s, approximately one third of patients with lung abscess died. Dr David Smith postulated that aspiration of oral bacteria was the mechanism of infection. He observed that the bacteria found in the walls of the lung abscesses at autopsy resembled the bacteria noted in the gingival crevice. A typical lung abscess could be reproduced in animal models via an intratracheal inoculum containing, not 1, but 4 microbes, thought to be Fusobacterium nucleatum, Peptostreptococcus species, a fastidious gram-negative anaerobe, and, possibly, Prevotella melaninogenicus. Lung abscess was a devastating disease in the preantibiotic era, when one third of the patients died, another one third recovered, and the remainder developed debilitating illnesses such as recurrent abscesses, chronic empyema, bronchiectasis, or other consequences of chronic pyogenic infections. In the early postantibiotic period, sulfonamides did not improve the outcome of patients with lung abscess. After penicillins and tetracyclines became available, outcomes improved. Although resectional surgery was often considered a treatment option in the past, the role of surgery has greatly diminished over time because most patients with uncomplicated lung abscess eventually respond to prolonged antibiotic therapy. Lung abscesses can be classified based on the duration and the likely etiology. Acute abscesses are less than 4-6 weeks old, whereas chronic abscesses are of longer duration. Primary abscesses are infectious in origin, caused by aspiration or pneumonia in the healthy host. Secondary abscesses are caused by a preexisting condition (eg, obstruction), spread from an extrapulmonary site, bronchiectasis, and/or an immunocompromised state. Lung abscesses can be further characterized by the responsible pathogen, such as Staphylococcus lung abscesses and anaerobic abscess or Aspergillus lung abscess. Most frequently, the lung abscess arises as a complication of aspiration pneumonia caused by mouth anaerobes. The patients who develop lung abscess are predisposed to aspiration and commonly have periodontal disease. A bacterial inoculum from the gingival crevice reaches the lower airways and infection is initiated because the bacteria are not cleared by the patient's host defense mechanism. This results in aspiration pneumonitis and progression to tissue necrosis 7-14 days later, resulting in formation of lung abscess. Other mechanisms for lung abscess formation include bacteremia or tricuspid valve endocarditis causing septic emboli (usually multiple) to the lung. Lemierre syndrome, an acute oropharyngeal infection followed by septic thrombophlebitis of the internal jugular vein, is a rare cause of lung abscesses. The oral anaerobe F necrophorum is the most common pathogen. Because of the difficulty obtaining material uncontaminated by nonpathogenic bacteria colonizing the upper airway, lung abscesses rarely have a microbiologic diagnosis. Published reports since the beginning of the antibiotic area have established that anaerobic bacteria are the most significant pathogens in lung abscess. In a study by Bartlett et al in 1974, 46% of patients with lung abscesses had only anaerobes isolated from sputum cultures, while 43% of patients had a mixture of anaerobes and aerobes. The most common anaerobes are Peptostreptococcus species, Bacteroides species, Fusobacterium species, and microaerophilic streptococci. Aerobic bacteria that may infrequently cause lung abscess include Staphylococcus aureus, Streptococcus pyogenes, Streptococcus pneumoniae (rarely), Klebsiella pneumoniae, Haemophilus influenzae, Actinomyces species, Nocardia species, and gram-negative bacilli. Two studies from Asia suggest that the bacteriologic characteristics of lung abscesses have changed. [2, 3] This finding is confirmed by a study performed by Takayanagi et al suggesting that Streptococcus species were the most common species, followed (in order of decreasing frequency) by anaerobes, Gemella species, and Klebsiella pneumoniae. These species were identified in this study with percutaneous ultrasonography-guided transthoracic needle aspiration and protected specimen brushes in a population of 205 patients. Both studies by Wang et al and Takayanagai suggest that aerobic organisms were more likely to be found in individuals with diabetes mellitus and periodontal disease, both risk factors for aerobic community acquired lung abscesses. Nonbacterial and atypical bacterial pathogens may also cause lung abscesses, usually in the immunocompromised host. These microorganisms include parasites (eg, Paragonimus and Entamoeba species), fungi (eg, Aspergillus, Cryptococcus, Histoplasma, Blastomyces, and Coccidioides species), and Mycobacterium species. The bacterial infection may reach the lungs in several ways. The most common is aspiration of oropharyngeal contents. Other patients at high risk for developing lung abscess include individuals with an inability to protect their airways from massive aspiration because of a diminished gag or cough reflex, caused by a state of impaired consciousness (eg, from alcohol or other CNS depressants, general anesthesia, or encephalopathy). An abscess may develop as an infectious complication of a preexisting bulla or lung cyst. 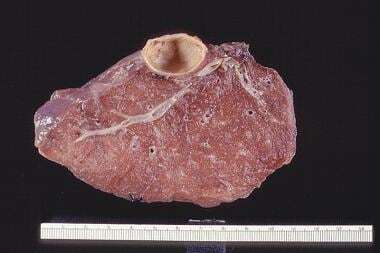 An abscess may develop secondary to carcinoma of the bronchus. The bronchial obstruction causes postobstructive pneumonia, which may lead to abscess formation. Underlying lung cancer in edentulous patients with lung abscesses should also be considered. The frequency of lung abscesses in the general population is not known. A male predominance for lung abscess is reported in published case series. The prognosis for lung abscess following antibiotic treatment is generally favorable. Over 90% of lung abscesses are cured with medical management alone, unless caused by bronchial obstruction secondary to carcinoma. For patient education resources, visit the Infections Center and Lung Disease and Respiratory Health Center. Also, see the patient education articles Bacterial Pneumonia, Antibiotics, and Bronchoscopy. Bartlett JG, Finegold SM. Anaerobic infections of the lung and pleural space. Am Rev Respir Dis. 1974 Jul. 110(1):56-77. [Medline]. Wang JL, Chen KY, Fang CT, Hsueh PR, Yang PC, Chang SC. Changing bacteriology of adult community-acquired lung abscess in Taiwan: Klebsiella pneumoniae versus anaerobes. Clin Infect Dis. 2005 Apr 1. 40(7):915-22. [Medline]. Takayanagi N, Kagiyama N, Ishiguro T, Tokunaga D, Sugita Y. Etiology and outcome of community-acquired lung abscess. Respiration. 2010. 80(2):98-105. [Medline]. Moreira Jda S, Camargo Jde J, Felicetti JC, Goldenfun PR, Moreira AL, Porto Nda S. Lung abscess: analysis of 252 consecutive cases diagnosed between 1968 and 2004. J Bras Pneumol. 2006 Mar-Apr. 32(2):136-43. [Medline]. Mwandumba HC, Beeching NJ. Pyogenic lung infections: factors for predicting clinical outcome of lung abscess and thoracic empyema. Curr Opin Pulm Med. 2000 May. 6(3):234-9. [Medline]. Pohlson EC, McNamara JJ, Char C, Kurata L. Lung abscess: a changing pattern of the disease. Am J Surg. 1985 Jul. 150(1):97-101. [Medline]. Hirshberg B, Sklair-Levi M, Nir-Paz R, Ben-Sira L, Krivoruk V, Kramer MR. Factors predicting mortality of patients with lung abscess. Chest. 1999 Mar. 115(3):746-50. [Medline]. Stark DD, Federle MP, Goodman PC, Podrasky AE, Webb WR. Differentiating lung abscess and empyema: radiography and computed tomography. AJR Am J Roentgenol. 1983 Jul. 141(1):163-7. [Medline]. Williford ME, Godwin JD. Computed tomography of lung abscess and empyema. Radiol Clin North Am. 1983 Sep. 21(3):575-83. [Medline]. Bouhemad B, Zhang M, Lu Q, Rouby JJ. Clinical review: Bedside lung ultrasound in critical care practice. Crit Care. 2007. 11(1):205. [Medline]. Bartlett JG. Anaerobic bacterial infections of the lung. Chest. 1987 Jun. 91(6):901-9. [Medline]. Sosenko A, Glassroth J. Fiberoptic bronchoscopy in the evaluation of lung abscesses. Chest. 1985 Apr. 87(4):489-94. [Medline]. Appelbaum PC, Spangler SK, Jacobs MR. Beta-lactamase production and susceptibilities to amoxicillin, amoxicillin-clavulanate, ticarcillin, ticarcillin-clavulanate, cefoxitin, imipenem, and metronidazole of 320 non-Bacteroides fragilis Bacteroides isolates and 129 fusobacteria from 28 U.S. centers. Antimicrob Agents Chemother. 1990 Aug. 34(8):1546-50. [Medline]. Perlino CA. Metronidazole vs clindamycin treatment of anerobic pulmonary infection. Failure of metronidazole therapy. Arch Intern Med. 1981 Oct. 141(11):1424-7. [Medline]. Sanders CV, Hanna BJ, Lewis AC. Metronidazole in the treatment of anaerobic infections. Am Rev Respir Dis. 1979 Aug. 120(2):337-43. [Medline]. Richter SS, Heilmann KP, Dohrn CL, Riahi F, Costello AJ, Kroeger JS, et al. Activity of ceftaroline and epidemiologic trends in Staphylococcus aureus isolates collected from 43 medical centers in the United States in 2009. Antimicrob Agents Chemother. 2011 Sep. 55(9):4154-60. [Medline]. [Full Text]. Wunderink RG, Niederman MS, Kollef MH, Shorr AF, Kunkel MJ, Baruch A, et al. Linezolid in methicillin-resistant Staphylococcus aureus nosocomial pneumonia: a randomized, controlled study. Clin Infect Dis. 2012 Mar 1. 54(5):621-9. [Medline]. Allewelt M, Schuler P, Bolcskei PL, Mauch H, Lode H. Ampicillin + sulbactam vs clindamycin +/- cephalosporin for the treatment of aspiration pneumonia and primary lung abscess. Clin Microbiol Infect. 2004 Feb. 10(2):163-70. [Medline]. Ott SR, Allewelt M, Lorenz J, Reimnitz P, Lode H. Moxifloxacin vs ampicillin/sulbactam in aspiration pneumonia and primary lung abscess. Infection. 2008 Feb. 36(1):23-30. [Medline]. Macfarlane DJ, Tucker LG, Kemp RJ. Treatment of recalcitrant actinomycosis with ciprofloxacin. J Infect. 1993 Sep. 27(2):177-80. [Medline]. Ferreira D, de F, Amado J, Neves S, Taveira N, Carvalho A, et al. Treatment of pulmonary actinomycosis with levofloxacin. J Bras Pneumol. 2008 Apr. 34(4):245-8. [Medline]. Clark NM. Nocardia in solid organ transplant recipients. Am J Transplant. 2009 Dec. 9 Suppl 4:S70-7. [Medline]. Sorrell TC, Mitchell DH, Iredell JR. Nocardia species. Mandell GL, Bennett JE, Dolin R, eds. Principles and Practice of Infectious Disease. 6th edition. Philadelphia: Elsevier; 2005. 2916. Herth F, Ernst A, Becker HD. Endoscopic drainage of lung abscesses: technique and outcome. Chest. 2005 Apr. 127(4):1378-81. [Medline]. Kelogrigoris M, Tsagouli P, Stathopoulos K, Tsagaridou I, Thanos L. CT-guided percutaneous drainage of lung abscesses: review of 40 cases. JBR-BTR. 2011 Jul-Aug. 94(4):191-5. [Medline]. Taniguchi M, Morita S, Ueno E, Hayashi M, Ishikawa M, Mae M. Percutaneous transhepatic drainage of lung abscess through a diaphragmatic fistula caused by a penetrating liver abscess. Jpn J Radiol. 2011 Nov. 29(9):663-6. [Medline]. Histology of a lung abscess shows dense inflammatory reaction (low power). Pneumococcal pneumonia complicated by lung necrosis and abscess formation. A lateral chest radiograph shows air-fluid level characteristic of lung abscess. A 54-year-old patient developed cough with foul-smelling sputum production. A chest radiograph shows lung abscess in the left lower lobe, superior segment. A 42-year-old man developed fever and production of foul-smelling sputum. He had a history of heavy alcohol use, and poor dentition was obvious on physical examination. Chest radiograph shows lung abscess in the posterior segment of the right upper lobe. A 42-year-old man developed fever and production of foul-smelling sputum. He had a history of heavy alcohol use, and poor dentition was obvious on physical examination. Lung abscess in the posterior segment of the right upper lobe was demonstrated on chest radiograph. CT scan shows a thick-walled cavity with surrounding consolidation. Chest radiograph of a patient who had foul-smelling and bad-tasting sputum, an almost diagnostic feature of anaerobic lung abscess. Histology of a lung abscess shows dense inflammatory reaction (high power). Disclosure: Serve(d) as a speaker or a member of a speakers bureau for: Integrity CE, Merck<br/>Received income in an amount equal to or greater than $250 from: – Array Biopharma, AstraZeneca, Aerocrine, Airsonett AB, Boehringer-Ingelheim, Experts in Asthma, Gilead, GlaxoSmithKline, Merck, Novartis, Ono Pharmaceuticals, Pfizer, PPD Development, Quintiles, Sunovion, Saatchi & Saatichi, Targacept, TEVA, Theron. Fast Five Quiz: How Much Do You Know About Pneumonia? When Is a Lung Abscess Like Popcorn?